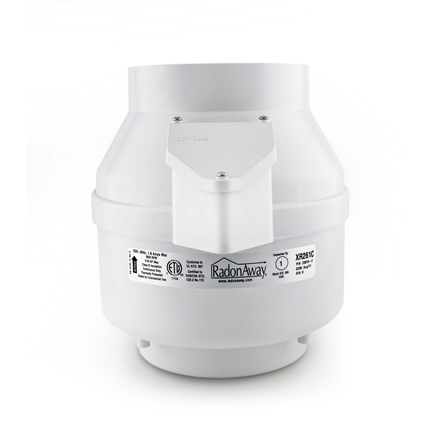 We feature Radonaway Mitigation fans because we know they are a superior product. I use them exclusively in my radon mitigation service business. 90% are still in service after 10 years. 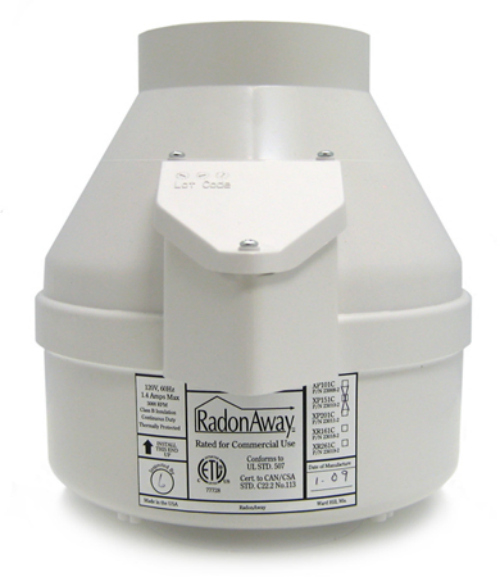 Radonaway offers a 5 year limited warranty. This page features the XP/XR series fans. This group is primarily used with high flow situations. This includes drain tile, gravel or where settling has occurred beneath the floor. These fans are slightly less powerful than the RP series fans, but can be snugged up closer to a wall since they are all 8.5" inches in diameter. This is 1" inch less than the RP145 and RP140. The XR261 has a similar fan curve as the RP260. But at a full 3" inches smaller in diameter they are an attractive alternative for outside installations. Please view the fan comparison chart for all WC (water column) and CFM values. For tight sub soil conditions the GP series fans are recommended. This fan can handle a wide range of situations. Designed to move large quantities of air from drain tile systems or gravel. With a max suction of 1.9"WC this not recommended for tight soil conditions. Replaces discontinued model XP201c. Note: Utility cords need to be purchased separately. 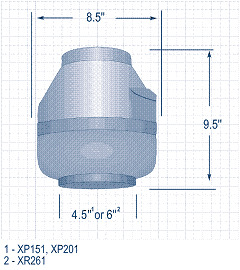 The XP201 has 4" openings thus requiring either 4"x4" or 3"x4" rubber couplings for mounting. When in doubt 4" pipe is recommended for the XP201. Varmint guards are a must to protect your fans warranty. This fan can handle a wide range of situations. Designed to move large quantities of air from drain tile systems or gravel. With a max suction of 1.6"WC this not recommended for tight soil conditions. Replaces discontinued model XP151c. Note: Utility cords need to be purchased separately. The XP151 has 4" openings thus requiring either 4"x4" or 3"x4" rubber couplings for mounting. When in doubt 4" pipe is recommended for the XP151. Varmint guards are a must to protect your fans warranty. This fan can handle a wide range of situations. Designed to move large quantities of air from drain tile systems or gravel. But also able to produce a maximum of 1.9WC for tighter sub soils. If you can do 2 suction points with loose soils this fan will provide good results with minimal energy usage. Replaces discontinued model XR261c. Note: Utility cords need to be purchased separately. The XR261 has 6" openings thus requiring 4"x6" rubber couplings for mounting. 4" pipe is required for the XR261. Varmint guards are a must to protect your fans warranty.